1. Alison, so many moms are both amazed and inspired by the fact that you have two small children, while also maintaining a busy career. 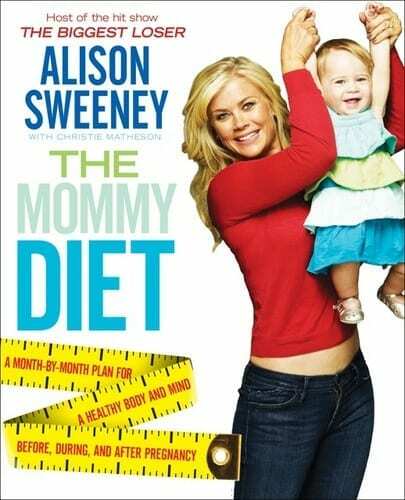 You are an actress on ‘Days of Our Lives’, the Host of ‘The Biggest Loser,’ and the author of the new book The Mommy Diet, how do you balance it all? I focus on what I need to do in each moment and give it 100% of my attention. If I’m making dinner with my family, I’m focused solely on that. If I’m at Days, I focus on giving the best performance I can while there. At the end of the week, I’ll look back and assess what I could have done better and work towards that in the next week. I do have a lot going on but I’m lucky to be as busy as I am and make the most of every moment. 2. What initially inspired you to get fit and become healthy and what do you think is the most important advice that you can share with moms who are trying to do the same? I have learned so much from being a part of ‘The Biggest Loser.’ I’ve been so inspired by the shows’ contestants, and seeing the changes they’ve made in their lives has had a profound effect on how I wanted to take care of myself and my family. I continue to be inspired by them, which is why I’m training for the 2012 Honda LA Marathon right now…watching the contestants run the marathon made me want to do it as well. 3. Our pets are our family members too and you recently partnered up with Hill’s Pet Nutrition, makers of Science Diet® and Prescription Diet® pet foods to kick-off the Million Pound Pledge to help dogs and cats maintain a healthy lifestyle. Why did you personally want to get involved with this campaign and can you tell us more about it? As the host of “The Biggest Loser” I never thought I’d be the owner of an overweight pet so this came as quite a surprise and I wanted to do something about it right away. We got some advice from the vet on how to get Winky to a healthier weight starting with a change in her diet – that’s where Hill’s Science Diet Light came in. Then I was shocked to find out that 1 out of 2 pets in America are overweight. When I realized that weight issues were not just for people I wanted to do something to help pets as well. In fact obesity can have serious consequences in pets, just like their owners. That’s why I teamed up with Hill’s Science Diet to kick-off The Million Pound Pledge. I’m hoping the Million Pound Pledge will help pet owners become more aware of their cats and dog’s health and provide a solution for getting pets healthy. I want to inspire pet owners everywhere to help their pets lose weight so go to PetFit.com to take the pledge and you’ll find some great tips on how to manage your pets’ weight.